Rowers come in a variety of shapes and sizes. They all offer basically the same type of workout. But depending on their construction, resistance system, and several other factors, the overall feel and impact of the workout may be different. There are many types of rowers that you can choose from, and not just about any model may fit into your home or workout that you require. Therefore, this page brings forth several of the best rowing machines. Our aim here is to make sure that the rower you choose is exactly the one that you need. We’ll point out here several important aspects regarding these machines, and ultimately, we’re going to present the top 10 rowers for 2019. 2 Why Should You Buy a Rowing Machine? Although the Concept2 Model D rowing machine has been around for over 5 years, it continues to be one of the best rowers on the market. Even after all these years, it still has a clean 5-star rating on many retail and fitness websites. And that’s because it combines sturdiness, effectiveness, and quality close to perfection. It’s a commercial-grade machine which you might have seen in many gyms or clubs. It’s definitely one of the top choices that you can make if you’re looking for a solid rowing machine. The Concept2 Model D features a fairly large frame (at least lengthwise). With the frame fully assembled, it’s approx. 96″ (244 cm) long, and 24″ (61 cm) wide. This being said, its rail is long enough to accommodate comfortably even users who are taller than 6’7″ (201 cm). Plus, Concept2 also sells even a longer rail for users who exceed 7′ (213 cm). The machine’s frame is made of steel and aluminum. The front section that sustains its drive system, its base stabilizer, and the rear stabilizer are made of steel. The rail is made of durable aluminum material and has a weight capacity of 500 lbs (227 kg), which is quite impressive for a rowing machine. Although the machine is fairly large, its frame can be folded. The rail with the seat folds vertically, this way reducing the length of the unit by approx. 2/3 (its length remains roughly 33″ – 84 cm). Most of the metallic parts in the rower’s construction are coated with a corrosion-resistant paint finish. Also, the front base features transport wheels to facilitate its relocation. The Concept2 Model D is equipped with a high-density foam seat. It doesn’t integrate extra cushioning, so its top is firm but not as firm as a wooden or metallic seat. Its surface is contoured and non-slip, to provide optimal comfort. The seat base is highly durable, made of steel parts. It incorporates three sets of wheels, two on top of the rail, and one under its sides. The wheels are equipped with top-quality ball bearings and deliver a very smooth back and forth motion of the seat. The top of the seat is placed at a distance of approx. 14″ (35.5 cm) above floor level. This being said, entry and exit shouldn’t be too difficult even for users with certain disabilities. 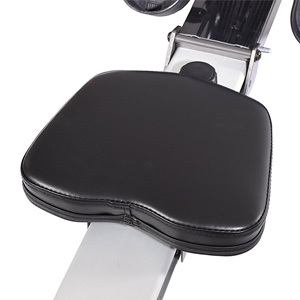 The machine’s footrests are adjustable, equipped with heel guards and adjustable straps. They’re large enough to accommodate athletic shoes of all types. They do not pivot on their axis, and their angle cannot be adjusted. However, they’re set at an angle of approx. 45° which provides an optimal foot positioning during rowing. The pulling handle has its grips slightly curved towards the user in order to minimize the impact on the wrists during rowing. 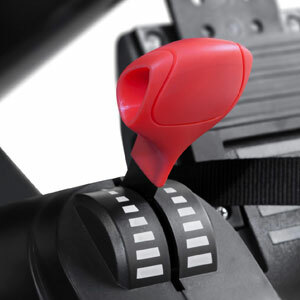 The grips are rubberized to maximum adherence and comfort. 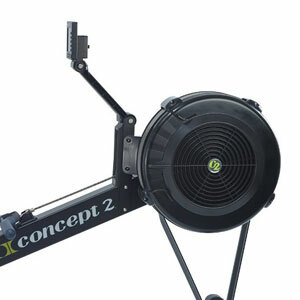 The Concept2 Model D is an air rowing machine. This being said, it generates a dynamic response during rowing. In other words, the intensity or the resistance generated is strictly related to the power or speed you put behind each stroke; the faster you pull, the more resistance the machine will generate. The unit’s resistance system is also equipped with a damper. This damper controls the air flow into the case. The more air is allowed in, the more effort is required to spin the flywheel. There are values from 1-10 on the damper. An optimal aerobic training is typically achieved while working on the 3-5 settings. On higher damper settings you can achieve an Olympic level workout. To be clear, the machine’s resistance system doesn’t include a magnetic brake like other machines. It’s a full air resistance, with its levels controlled solely by the integrated damper. Last but not least, the machine features a chain drive. The handle is attached to a nickel-plated chain similar to a bike chain. This type of drive can last a lifetime with proper care. 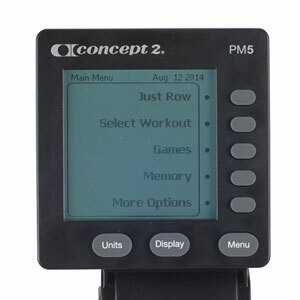 This Concept2 rowing machine comes with the PM5 console. This offers quite a few more features than the average basic unit. To begin with, it has an LCD display which can indicate several values simultaneously so you won’t have to use a scan function. It can track total time elapsed, strokes per minute, total meters rowed, time/500m, avg. time/500m, split meters, heart rate, and projected meters in 30 min. The PM5 unit has several built-in games. Among them, we can count a Fish Game, a Darts Game, Target Training and Biathlon. The console can save your recent workout data in its memory. However, it also has a USB port so you can save your data on a USB flash drive. You can also upload your workout data on the concept2 website at the logbook section, to keep a better track of your progress. An angle-adjustable mount attached to the PM5 unit, giving you the possibility to select the best viewing angle. The unit requires 2 D-type batteries. It’s also compatible with various Polar or Garmin pulse reading bands. The Concept2 Model D is one of the best (if not the best) air resistance rowers at the moment. It offers a commercial-grade construction, a high load capacity, an optimal comfort seat, and adjustable footrests. It’s also equipped with an advanced console which can track multiple workout metrics, has several built-in games, and offers workout data transfer possibilities. It’s a machine for users of all levels, from beginners to professional athletes. In all, it offers outstanding value and quality for the price. WaterRower offers a wide array of top-quality rowing machines. We’ve selected the Club HiRise model for our selection here because it includes the longer stabilizing feet. However, you can opt for many other models, such as the WaterRower GX, the classic WaterRower Natural, or the WaterRower M1 which has an aluminum frame. They’re all high-quality machines, great for users of all levels. The WaterRower Club HiRise features a frame completely made of Ash wood stained with a rosewood tint which gives it a higher resistance to soiling. All the wooden parts in the machine’s construction are imbued with Danish oil for extra protection. Also, the side rails are urethane-dipped featuring a black finish with the WaterRower logo appearing in white. These being said, the rower has a very warm and welcoming aspect, which can play as a motivation factor. This WaterRower is fairly large. With the frame fully assembled, it’s approx. 82″ (208 cm) long, and 22″ (56 cm) wide. This being said, the side rails are long enough to accommodate users with an inseam of 38″ (96 cm). The unit is also fairly heavy; with water in the tank, it weighs approx. 114 lbs (47 kg). As opposed to other rowing machines, this one does not have a folding design. However, the frame can be stored in a vertical position. Its front base is equipped with transport wheels, so its relocation can be done with ease. As the unit’s name suggests, this is a HiRise rower. This means the package includes the four extra foot stabilizers which elevate the machine by a few inches. This feature can be very useful to users with certain disabilities as it places the seat at approx. 20″ (51 cm) above floor level, offering an easier entry and exit. 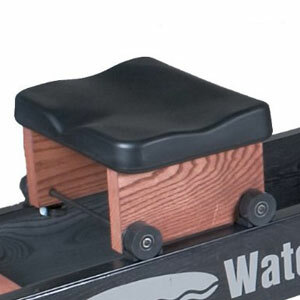 This WaterRower model features a fairly standard seat. Its structure combines steel, vinyl, and Ash wood elements. Its top section has a contoured surface and a layer of foam padding in order to provide a superior comfort. The seat is equipped with four durable rollers. They integrate stainless steel ball bearings for smooth operation, with a PVC coating on the outside. The extrusions of the rails, on which the seat glides, are also PVC made. The gliding surface is also much tolerating with any small particles that may fall on it. As opposed to that, if the glides of a rower are metallic, even the slightest dirt particle fallen on it will result in bumps and clicks during rowing. The seat and the rails have a very durable construction. Most sources specify a weight capacity of 1,000 lbs (453 kg). So, it’s pretty much safe to say, that the unit should be able to support users of all sizes. The machine offers a pretty standard footrest setup. The footrests are length-adjustable. They have heel guards and straps for a maximum foot stability. They’re directly attached to a wooden board which is placed at an angle of approx. 45°, for optimal foot positioning. 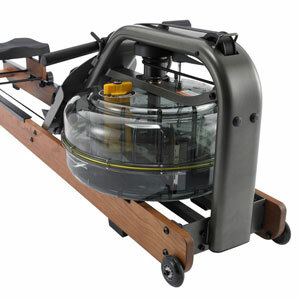 Since it’s a WaterRower, this rowing machine features a fluid resistance system. It’s equipped with a 4.5 gal (17 l) tank, which is made of highly durable polycarbonate material. It integrates a 2-blade impeller which is connected to a system of heavy-duty bungee cords and pulleys. The pulling handle is a simple straight bar with rubberized grips, attached to a durable mesh strap highly resistant to abrasion. Like most other water resistance rowers, the HiRise Club model offers a dynamic response during rowing and a rowing feel that resembles rowing a real boat through water. The resistance generated depends on how hard or fast you pull the handle. In other words, the harder you pull, the higher the rowing difficulty. The water tank doesn’t have a resistance adjustment system. However, you can still adjust the overall water resistance by adding or removing water from the tank. As a general idea, with the tank filled to its maximum capacity, the machine provides an Olympic level of difficulty. The WaterRower Club HiRise comes with the S4 exercise meter which features a large LCD display and shows multiple workout metrics simultaneously. It tracks speed (or intensity), watts, KCalories per hour, stroke rate, heart rate, and distance. The S4 rowing computer has built-in Interval Workout Settings for distance and intensity, as well as 9 Advanced Workout Programs. It’s PC interface capable, via a monitor cable. Also, this type of performance monitor has built-in PC interface capability. In other words, you can connect it to your PC via cable, and use several apps such as WaterRower’s Online Rowing Community, WebRacing, and WaterCoach FIT. This rowing machine does not have any incorporated pulse sensors, but the S4 meter is telemetric. It can read your pulse via an ANT+ or Polar HR strap transmitter. This accessory is not included, though. Last but not least, the console is battery-powered. It requires 4 AA batteries. It also has a sleep mode to which will enter after several minutes of inactivity on the machine. The WaterRower Club HiRise is a gym-grade rowing machine, featuring a highly durable Ash wood frame, water resistance which delivers a dynamic response with every stroke. It includes the S4 fitness monitor which has 9 built-in programs and is also telemetric. 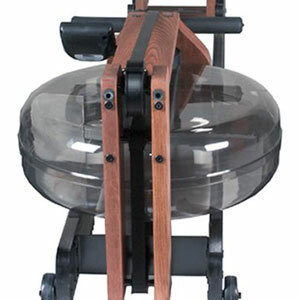 This WaterRower also includes the HiRise Adapter Kit. And finally, it’s not the most affordable WaterRower, but its quality definitely matches the price. First Degree Fitness is another top manufacturer of rowing machines. 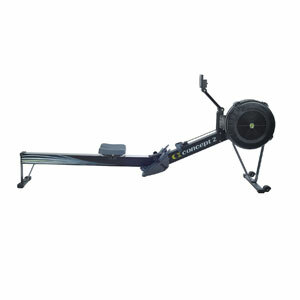 They offer several top-rated rowers such as the Viking 2 AR, Apollo, or Daytona Challenge. The model that we’ve selected for our top 10 is the FDF Apollo Pro II. Although this model was released at the beginning of 2017, it still remains one of the best fluid rowing machines in 2019. The First Degree Fitness Apollo Pro II features a frame construction similar to the WaterRower Club model that we’ve presented above. However, only its side rails are made of Ash wood; the front section of the frame which supports the water tank is steel made. The wood rails are imbued with Danish oil for a durable and warm finish. The steel frame section is coated with a corrosion-resistant powder finish. The machine is fairly large; with the frame fully assembled it’s approx. 84″ (213 cm) long, and 22″ (56 cm) wide. This being said, it’s not exactly fit for a small room or apartment, but on the other hand, it can be stored vertically. The Apollo Pro II fluid rower is fairly heavy; with a full tank of water, it weighs approx. 112.5 lbs (51 kg). This weight provides excellent stability. However, the unit is not too difficult to move. Its front base features a set of wheels which facilitate its relocation. 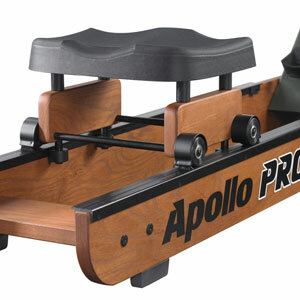 The FDF Apollo Pro II rowing machine is equipped with an ergonomic seat. Its top features a layer of high-density foam material which is also contoured, offering optimal comfort. 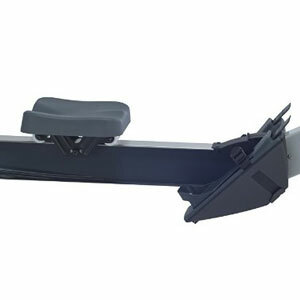 It also prevents the user from sliding backward or forward from the seat during rowing. The base of the seat combines Ash wood elements with steel elements. It integrates four high-grade wheels equipped with sealed ball bearings for a smooth operation. Each wheel has a top cover for improved safety. The seat assembly and the two rails are rated for a weight capacity of 330 lbs (150 kg), which is more than enough for a wide range of users. Also, the rails are long enough to accommodate users up to 6’5″ (196 cm) with no problem, promoting a complete leg extension. The machine’s footrests are attached to a metallic plate which features an angle of approx. 45°-50°, providing an optimal foot positioning. They’re adjustable and large enough to accommodate feet of all sizes. They also have straps and heel guards. Since it’s a fluid rowing machine, the First Degree Fitness Apollo Pro II is equipped with a polycarbonate water tank which integrates a patented 3-blade metallic impeller. Its capacity is 4.5 gal (17 liters). The pulling handle is attached to a heavy-duty, abrasion-resistant nylon strap. As you pul the handle, the impeller starts to spin inside the tank, creating the necessary resistance. 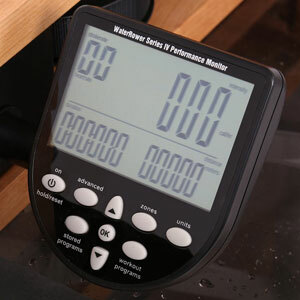 As opposed to most of the WaterRower fluid resistance tanks, the one on the Apollo Pro II features an adjustable water level system. It’s divided into two chambers and has a dial on top. The dial offers 4 distinct settings. It allows you to shift a portion of the water from the impeller chamber to a storage chamber, in order to change the overall water resistance. Nonetheless, since it’s a water resistance rower, the FDF Apollo Pro II offers a dynamic response during rowing. In other words, if you pull harder or faster, the resistance generated is higher. Conversely, if you diminish your stroke intensity, the generated resistance will also decrease. 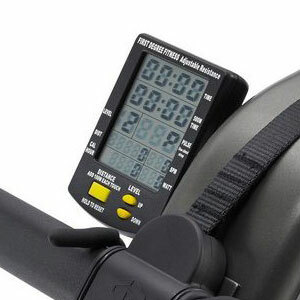 This First Degree Fitness rower is equipped with an advanced fitness meter. It features a multi-window LCD display which tracks time, 500M time, strokes per minute, distance, pulse, watts, and calories per hour. 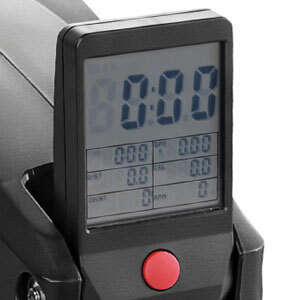 For distance, the meter unit offers the possibility to add 1000m for each press of the larger button. Also, this button covers the unit’s reset function. By holding it down for 3 sec., the unit will reset. Since the unit’s water tank has 4 levels of difficulty, the console has 4 level settings as well. Therefore, it’s recommended to correlate it with the water tank level selected by the dial, in order to provide more accurate readings. The console unit also has a USB port which allows you to connect it to a PC via cable and use various FDF apps such as NetAthlon 2, for example. These apps not only that give you the possibility to keep track of your progress online, but also give you the possibility to compete with other users. The unit is battery powered. It uses 2 AA batteries. Also, for the reading of your pulse, it requires an optional receiver and chest strap, accessories which are not included. The First Degree Fitness Apollo Pro II is a water resistance rower featuring a commercial construction, superior ergonomics, and a multi-function fitness meter. Its water tank has 4 distinct levels of difficulty, plus the specific dynamic response. It’s an excellent trainer for users of all levels offering an exceptional price/quality ratio. 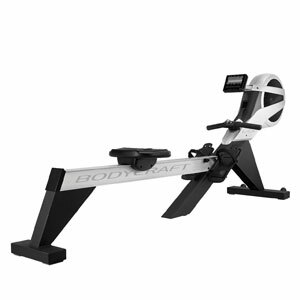 The BodyCraft VR500 Pro is a commercial-grade rower featuring a rock-solid construction just like the Concept2 machines. However, its air resistance system is assisted by a magnetic brake. Also, one of the pluses of this machine is its long rail which can accommodate tall users. Even though it’s considerably more expensive than the BodyCraft VR200 model, we’ve chosen the VR500 for our category of best 2019 rowers simply because it has much better ratings. The BodyCraft VR500 Pro rowing machine combines steel and aluminum elements in its construction. Its rail is made of anodized aluminum while the front part that sustains the fan and the rear stabilizer is made of steel. The casing of the fan and the magnetic brake is made of durable ABS material. As we’ve mentioned above, this BodyCraft rower is quite large; when fully set up, it takes approx. 98″L x 20″W (250 x 51 cm) of floor space, which means it’s not exactly the best fitness machine for a small room. And even if the frame is foldable, with the rail folded up the unit it’s still 50″ (127 cm). The unit’s rail is long enough to accommodate users up to 6’6″ (198 cm). The unit is also fairly heavy; it weighs approx. 101 lbs (46 kg). However, it front base has transport wheels for ease of relocation, if necessary. The BodyCraft VR500 Pro is equipped with a fairly large seat. Its top is contoured and has a layer of padding to improve comfort. Its rear part also has a small border which prevents the user from sliding backward when rowing. The seat base is made of steel but its sides have ABS covers which also conceal the wheels which are four in number. The wheels integrate sealed ball bearings for a smooth operation. The machine’s rail and seat are designed to support users up to 350 lbs (159 kg). The top of the seat stands at approx. 19″ (48 cm) above floor level. Thus, it should be high enough to supply an easy mount/dismount even for users with impaired movement or other disabilities. 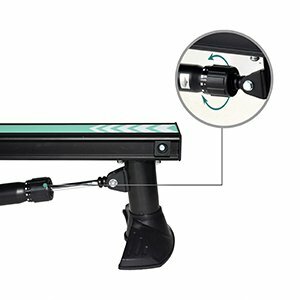 The unit’s footrests are fixed at an angle of 40-45 degrees in order to offer a correct positioning for your feet during rowing. They are attached to the front steel part of the frame via two screws each so they don’t pivot. But on the other hand, they are adjustable. They’re equipped with straps and heel guards to keep your feet perfectly secure during each rowing session. The rowing handle features an ovalized design. It’s fully covered by a layer of high-density foam to provide a secure grip. Its connection point to the nylon strap features several buttons which for resistance control and other commands for the console. 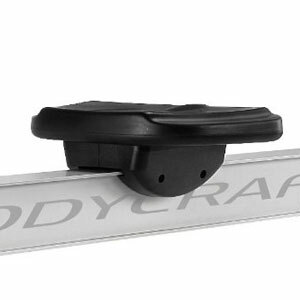 The BodyCraft VR500 Pro features an air and magnetic resistance system. 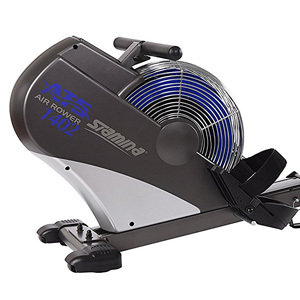 In other words, it’s equipped with a flywheel-fan similar to any other air rower. This fan helps to generate a dynamic response with each stroke. However, the unit’s resistance system also integrates a magnetic brake. This gives you the possibility to increase or decrease the overall resistance of the rower. The magnetic brake is motorized. This means the unit needs to be connected to a power source. An AC adapter – Input: 120V 60Hz 18W, Output: 9VDC 1000mA – is included with the machine. The resistance can be adjusted from the console, but as we’ve mentioned above, the pulling handle also has incorporated tension controls. There are 32 resistance levels available. This first level offers only the resistance of the fan. Each level adds a little bit of tension, while the top 30-32 levels provide quite a high difficulty, great for professional athletes. This BodyCraft rowing machine is equipped with a digital console featuring an LCD display with large, easy to read digits. It tracks distance, time, strokes per minute, pulse, calories, and watts. It also indicates the current resistance setting and the current profile. Evidently, all the metrics are shown simultaneously, so you don’t have to use a scan function. The console offers quite a few programs. First of all, there is a Quickstart program which allows you to row and adjust the resistance as you like during your sessions. There is a Manual program which allows you to define goals for time, distance, and calories. There are 12 preset programs, 5 race modes, 2 interval programs (time and distance), 4 custom definable programs, and 4 HRC programs. The console is compatible with Polar T31 and Polar T34 HR chest straps. However, the machine does not include an HR chest strap. 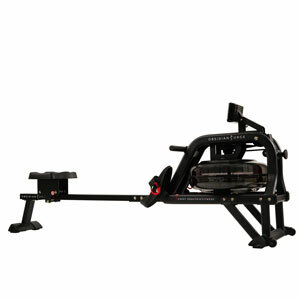 The BodyCraft VR500 Pro is a commercial-grade rower equipped with an air & magnetic resistance system. It offers 32 resistance levels and has a console with over 30 workout programs. Its frame offers superior sturdiness and also has a folding design. In all, it’s definitely a superior rowing machine, great for users of all levels; it’s not exactly cheap but offers an outstanding value for the price. The Obsidian Surge 500 is one of the rowing machines released by Sunny Health & Fitness at the end of 2017. It still remains one of the best Sunny rowers in 2019, and so far, it has actually gathered a pretty impressive feedback from users all over the world. 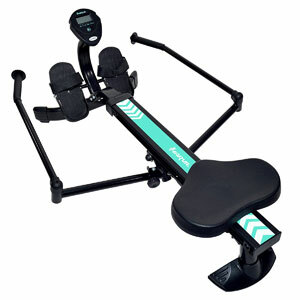 It’s also one of the most affordable rowing machines with a water resistance system that you can find at the moment. For reference, this is the Sunny Health & Fitness SF-RW5713. 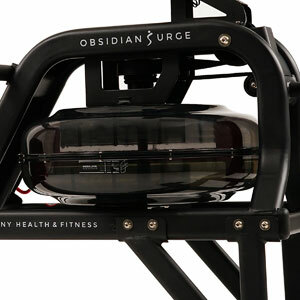 The Obsidian Surge 500 rowing machine features a steel frame, offering a weight capacity of 250 lbs (113.3 kg). It’s not an extremely large unit; with the frame fully assembled, it takes approx. 79″L x 22″W (200 x 56 cm). However, its rail offers enough seat travel in order to accommodate users up to 6’3″ (190 cm). This Sunny rower doesn’t have a folding frame. However, it can be stored vertically. Its front part of the frame guards the water tank pretty well and is equipped with an extra leveler to provide great stability to the machine when stored vertically. In case you’re wondering when stored in an upright position, its length is reduced by approx. 2/3. The machine’s rear base is equipped with adjustable stabilizers, while the front base has transport wheels to facilitate its relocation. All the metallic parts in its construction are coated with a corrosion-resistant paint finish. The color used is black, with the Sunny logo painted red/white. The Sunny Obsidian Surge 500 rower is equipped with a padded and contoured seat, designed for optimal comfort. Its top is approx. 10″D x 12.5″W (25.4 x 32 cm), offering plenty of contact surface. It’s situated at approx. 17″ (43 cm) above floor level, offering excellent entry and exit possibilities. The seat base integrates 6 wheels, 4 above the rail, 2 underneath it. They are equipped with sealed ball bearings for smooth use and a prolonged lifespan. They’re concealed by the lateral metallic parts in order to maximize safety. 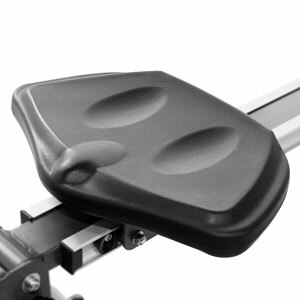 The rower features two pivoting footrests, large enough to accommodate feet of all sizes. They are equipped with adjustable straps and their rear features a heel guard to prevent your feet from sliding down. Since they have a pivoting design, they allow a slight movement of your feet with each stroke, adapting perfectly to your motion. Last but not least, the machine’s pulling handle is a simple straight bar featuring rubberized grips for extra comfort. It doesn’t have pulse sensors or console controls. It’s attached to a durable nylon strap which is highly resistant to abrasion. The Sunny Health & Fitness Obsidian Surge 500 features a water resistance system. It’s equipped with a durable polycarbonate tank which integrates a 3-blate metallic impeller. The exact capacity of the tank isn’t specified, but as a general idea, it’s smaller than for the most First Degree Fitness rowers. The water tank doesn’t have a resistance adjustment system. However, you can still vary the overall resistance generated by adding or removing water from it. There are 6 water levels marked on the tank and Sunny Health & Fitness recommends to not fill it over the 6th level. 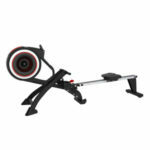 Since it’s equipped with a fluid resistance system, this machine delivers a dynamic response during rowing. In other words, the resistance generated depends on how hard or fast you pull the handle. Just as for other fluid rowers, the water in the tank requires chlorine treatment. For this, a pack of water purification chlorine pills is included with the unit. 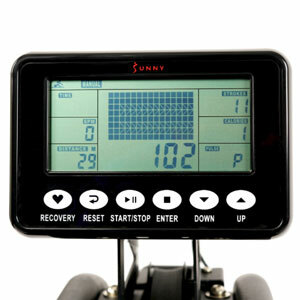 The exercise meter included with this Sunny rowing machine is a mid-range unit. To begin with, it features a multi-window LCD display which shows all the metrics at once. It tracks time, time/500m, SPM, strokes, distance, calories, and pulse. Distance is measured in on in meters. The machine doesn’t have any pulse sensors, so the unit can only read your pulse via a wireless chest strap. This accessory is not included, but the unit should work with any 5.3 kHz HR chest strap transmitter. In terms of programs, the unit has two, the Manual Mode and the Race mode. For the manual mode, you can either exercise freely, or set up targets for time, distance, strokes, calories, and pulse. The Race mode has 15 levels of difficulty, for the 500m/time. For level 1, the time is set at 8:00 min, while for level 15 it is set at 1:00 min. The unit has a Recovery function. It’s battery-powered and requires 2 AA batteries. It also has a sleep mode to which it will enter after 4 minutes of inactivity. The Sunny Health & Fitness Obsidian Surge 500 is a water resistance rower featuring a durable frame, excellent ergonomics, and a mid-range console with two main workout modes. Although it’s not a commercial-grade machine, it offers excellent quality and can accommodate a fairly wide range of users. It’s also one of the most affordable water resistance rowers available at the moment. 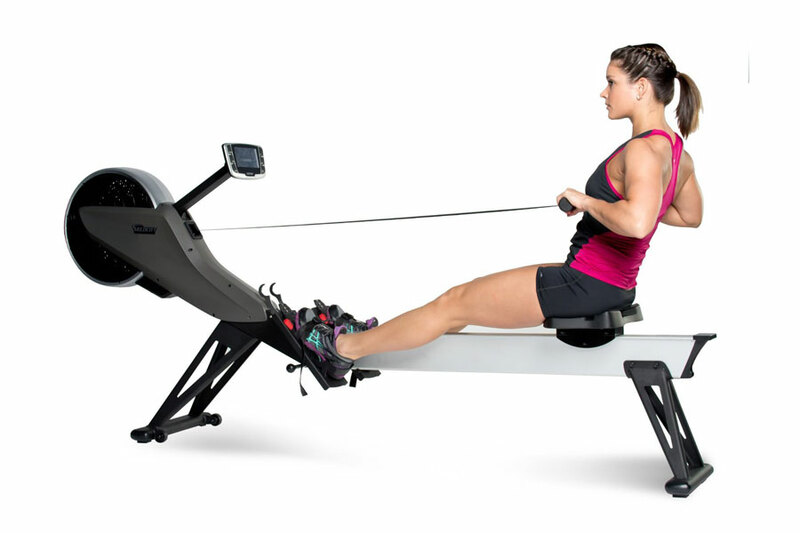 The Turbine NS-6050RE is one of the rowers released by Marcy Fitness at the beginning of 2016. So, even though it has been available for three years, it’s still one of the hybrid air/magnetic rowers that stand out. It’s a well-built machine, offers a pretty decent range of features, and on top of that, it costs half the price of a commercial rower. The Marcy Turbine NS-6050RE features a frame made of steel, aluminum, and ABS parts. The rail has a steel core while the two side beams are made of aluminum in order to provide a smoother travel for the seat. The front section of the frame and the rear base stabilizer are made of steel, while the covers of the fan and the resistance system are ABS-made. The machine offers a pretty sturdy construction. Its rail assembly is designed to support users up to 300 lbs (136 kg). It’s also long enough to accommodate users up to 6’5″ (196 cm). The trainer itself is fairly large. Its base footprint is 86″L x 20.5″ (218 x 52 cm), but the rail with the seat folds up. This way, its length is reduced by a bit more than half. The frame rests on three bases. The rear one is equipped with adjustable stabilizers. The middle base has two small transport wheels, while the front base features two stronger legs with ABS covers on their ends for extra stability. The Marcy NS-6050RE features a fairly large seat. Its top integrates a layer of foam padding for extra comfort; it’s also contoured to provide a better positioning and improve adherence. The base of the seat is steel-made; it’s equipped with 6 heavy-duty rollers which integrate sealed ball bearings in order to provide a smooth and quiet travel for the seat. All the rollers are concealed by the side sections of the seat resulting in a better safety. The seat is placed at approx. 16″ (40 cm) above floor level. This being said, it shouldn’t be too difficult even for users with certain disabilities, or elderly users to position themselves on the seat and use the machine. This Marcy rower is equipped with two large footrests, attached to steel plates. Each steel plate is connected to the main frame via two long bolts. Therefore, the footrests are well-fixed in place. Their angle is approx. 50° offering an optimal foot positioning. The footrests are size adjustable. They also have straps and heel guards for maximum foot stability. Just as the BodyCraft VR500 that we’ve presented above, the Marcy Turbine NS-6050RE rower features a hybrid, air & magnetic resistance system. The front turbine integrates a flywheel which generates the unit’s dynamic response. Differently put, the flywheel delivers a rowing feel which is closer to the rowing of a real boat through the water. The role of the magnetic brake is to increase or decrease the overall resistance level. The magnetic resistance system is not motorized. It consists of a small brake which is attached to the small lever at the front of the unit. By pressing the lever down, you can increase the overall tension level of the machine. There are 8 tension levels available. The first tension level doesn’t actually use the magnetic brake. When using this tension level you will basically benefit only by the resistance produced by the internal fan. Conversely, the top 7-8 tension settings add quite a bit of resistance, giving you the possibility to benefit from a higher muscle burn and cardio activity. 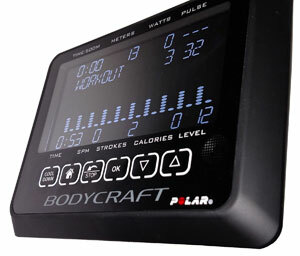 The rower’s console features a multi-window LCD display which is a plus as you can view multiple workout stats at once. The top, larger window shows the workout stats in a sequence, each one appearing for a few seconds. This scan function can be stopped by pressing the button. The six smaller displays indicate time, distance, count, speed, calories, and RPM. Since the magnetic brake is mechanical, the console plays no role in the machine’s resistance adjustment. 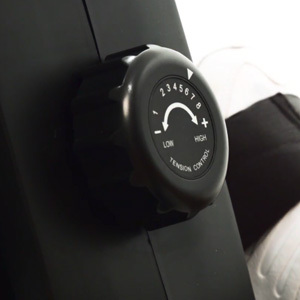 It’s only a fitness meter designed for tracking your workout stats. The console is not telemetric. In other words, it does not have a pulse reading function and it is not compatible with any Polar or ANT HR chest straps. The console is battery powered. It requires two 1.5 V (AAA) batteries. It starts up when you press the button or when you begin rowing. However, it also has a sleep mode to which will enter after four minutes of inactivity on the machine. The Marcy Turbine NS-6050RE is a mid-range rowing machine equipped with a hybrid air & magnetic resistance system. 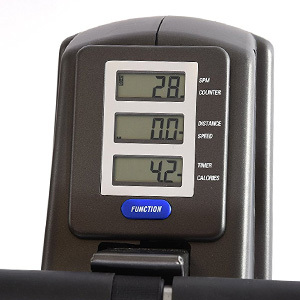 It features a solid and folding frame and includes an exercise meter for tracking speed, time, distance, count, RPM, and calories. Although it doesn’t have the load capacity of a commercial rower, it can still hold users up to 300 lbs. It’s also not a very expensive machine, being half the price of a commercial one. 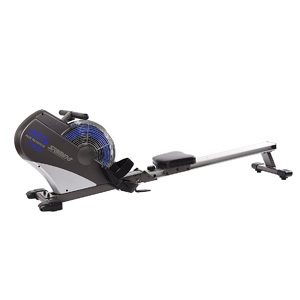 The ERG200 magnetic rower is currently the most affordable model from XTERRA Fitness. It’s a machine designed for home use but does offer an excellent sturdiness, design, and range of features. So far, it has benefited from a positive feedback from most users, and that’s one of the main reasons we’ve selected it for our list here. The XTERRA Fitness ERG200 combines steel, aluminum, and ABS parts in its construction. The front part of the frame, as well as its rear stabilizer, are made of steel. The covers of the resistance system are made of durable ABS material. The rail assembly features a steel core and two aluminum side beams on which the seat glides. All the steel parts in the frame are coated with a black paint finish which is resistant to corrosion. The aluminum side rails have their own natural finish, though. The machine isn’t extremely large compared to other trainers. However, it still takes approx. 72″L x 21″W (183 x 53 cm) of floor space. Its rail is long enough to accommodate users up to 6’2″ (188 cm), promoting a complete leg extension. It’s also sturdy enough to support users up to 250 lbs (113 kg). The rail is oblique, not horizontal. Due to this fact, the machine offers a better workout for the legs. The rail also folds up, in order to offer better storage possibilities. This XTERRA rowing machine is equipped with a large, contoured seat, with a high-density foam top. It provides plenty of contact surface and delivers an excellent level of comfort. Its base features high-grade rollers with sealed ball bearings for a smooth travel. The rollers are concealed to prevent your clothing to get caught into them and to increase the overall safety. 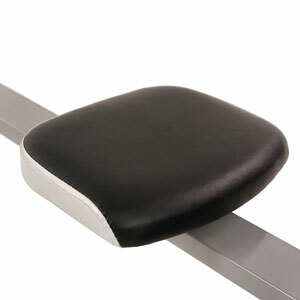 The rower’s footrests are made of heavy-duty ABS material. They’re equipped with adjustable velcro straps to keep your feet secured during your workout sessions. They also have rear guards to prevent your feet from sliding backward. The footrests feature a pivoting design. In other words, they can slightly adjust angle during each rowing motion, adapting perfectly to your posture, and delivering maximum comfort. The rear base of the unit features polygonal stabilizers allowing you to perfectly level the machine on any type of floor. Also, the front base is equipped with transport wheels to facilitate the relocation of the unit once you have finished your workout. 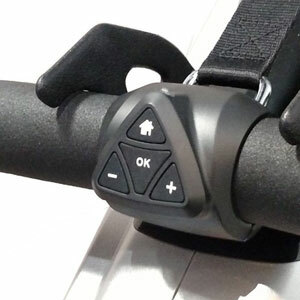 The XTERRA ERG200 rowing machine is equipped with a manual magnetic resistance system. This means you don’t have to connect it to a power source. The main resistance elements are a magnetic brake which is attached to the tension dial on top of the front part of the machine, and the internal flywheel. By turning the tension dial clockwise, the brake moves closer to the flywheel increasing the resistance. There are 8 resistance levels available. The 7-8 levels don’t offer the resistance required by a professional athlete, but the machine does supply light to medium cardio workout possibilities, great for anyone who wants a full body workout. Since the unit’s resistance system is full-magnetic, without any air or fluid resistance elements, it doesn’t provide a dynamic response. In other words, the resistance remains constant, given by the selected tension level, regardless of how fast you pull the handle. Last but not least, the internal flywheel features a balanced design. It weighs 9 lbs (4 kg) and delivers a very smooth and steady motion. 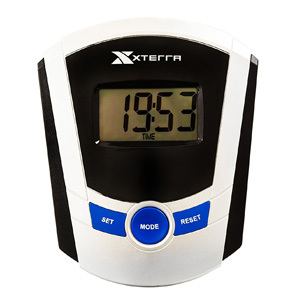 This XTERRA Fitness rower is equipped with an exercise meter that offers several more features than a basic unit. To begin with, it has a 3.7″ LCD display which tracks time, count, total count, and calories burned. It has a scan function which rotates all these values showing each one on the display for a few seconds. The unit does not have a pulse reading function, though. There are no preset programs available on the machine’s console unit. However, it does offer countdown settings for time, count, and calories. When you select a target for one of these workout metrics, the unit will countdown from it until it reaches zero. The console doesn’t play any role in the machine’s resistance adjustment. It only tracks your workout metrics. It’s powered by 2 AA batteries which are included. It has a self-shutdown feature which will initiate after several minutes of inactivity on the machine and starts up when you begin rowing or when you press the Mode button. The XTERRA ERG200 is a magnetic resistance rower, featuring a steel-aluminum construction, with a folding design. It’s quite a sturdy machine, being able to support users up to 250 lbs. It includes a fitness meter which keeps track of your strokes, workout time, and calories burned. Although it’s a machine designed for home use, it offers a pretty decent construction and overall quality. And finally, it’s quite an affordable unit, currently priced under the mark of $250. The ATS 35-1402 is one of the older rowing machines from Stamina; but even though it has been around since 2016, it’s still available and still continues to benefit from 4 to 5-star reviews from all users. It’s a rower for home use, equipped with an air resistance system. Like many other rowing machines, the Stamina 35-1402 ATS has a frame made of steel and aluminum elements. The front part that holds the fan and the other parts of the resistance system is made of steel, while the rail is aluminum-made. The base part of the resistance system guard is made of ABS material, but the top is metallic and allows the flywheel to be seen. The unit is at least 15″ (38 cm) smaller than most professional rowing machines. However, it still takes approx. 73″L x 19″W (187 x 46 cm) of floor space. But on the other hand, the frame has a folding design; the rail can be folded up, so the unit’s length is reduced by more than half. The fully assembled machine isn’t extremely heavy. It weighs approx. 55 lbs (25 kg). Therefore, its assembly and relocation shouldn’t be a problem for most users. Plus, its relocation is facilitated by the front base wheels. 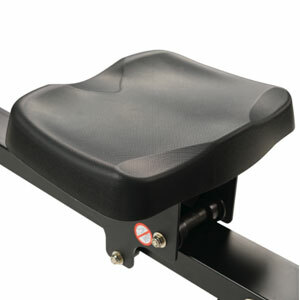 The Stamina 35-1402 ATS air rower is equipped with a fairly large seat. It’s approx. 14″ (35 cm) at its widest point, providing plenty of contact surface for a comfortable position. The top of the seat is cushioned; it integrates approx. 2″ (5 cm) of foam padding in order to deliver maximum comfort. Also, its upholstery is made of durable and sweat-proof vinyl material. The base of the seat is made of steel; it moves on six wheels which are hidden by the side parts to maximize safety. The whole seat assembly and its rail are durable enough to support users up to 250 lbs (113 kg), while the rail is long enough to accommodate users up to 6’4″ (193 cm). The unit’s footrests are non-adjustable, but they are large enough to accommodate feet of all sizes. They’re equipped with velcro straps and have deep guards at the rear in order to provide a perfect foot stability during exercising. The footrests also have a pivoting design. They can tilt forward or backward on their axis, delivering an optimal positioning for each one of your feed throughout the rowing motion. This Stamina rowing machine is equipped with an air resistance system. It integrates a fairly large fan which delivers a dynamic response during rowing. The trainer does not have any other resistance adjustment elements. It does not have a magnetic brake, nor it has a damper as the Concept2 Model D. However, just as any other rower with an air resistance system, the rowing difficulty progressively increases with the strength you put behind each stroke, resembling the rowing of a real boat. The machine does generate a bit of sound during usage. However, the fan isn’t extremely loud. Its sound can be compared to the sound produced by a large electric fan. One last aspect to mention here regards the unit’s other drive elements. Its pulling handle is a simple straight bar with rubber-foam grips. It is attached to an abrasion-resistant nylon strap. Since it uses a strap and not a chain, it doesn’t require lubrication. Also, the vibration is almost inexistent. 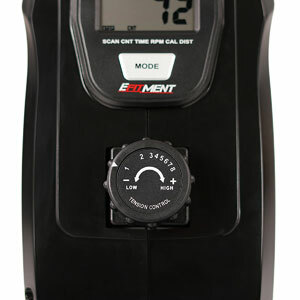 The Stamina 35-1402 ATS is equipped with a fitness meter that’s a bit better than the average basic unit. That’s because it’s actually equipped with three displays, so you can see three workout metrics at once. The top display shows SPM and count, the middle display indicates distance and speed, while the bottom display covers the elapsed time and calories. The unit does not have a pulse reading function. Its button allows you to swap the readings on the three displays. Also, by pressing and holding it down, you can reset all the metrics to zero. The meter does not have any programs or goal settings. It starts up if you press the button or if it detects movement on the machine. It also has a sleep mode to which it will enter after a few minutes of inactivity on the machine. 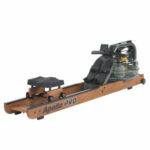 The Stamina 35-1402 ATS is an entry-level air resistance rowing machine. It features a fairly durable frame with a folding design, a comfortable seat, and a 3-display fitness meter. It’s an excellent unit for home use if you want to undergo a full-body cardio workout or lose some weight. 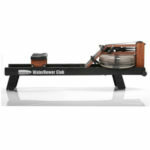 It’s a great alternative for a commercial-grade air rower if you’re on a budget. The Harvil RM-1 is a hydraulic rowing machine almost identical in specs and construction to the Stamina BodyTrac Glider 1060. Like most rowers with a hydraulic resistance system, this model is fairly small and portable. But nonetheless, it has an excellent construction, quality, and overall ratings, these being some of the reasons we’ve selected it for our best 2019 rowers category. The Harvil RM-1 rowing machine features a durable steel construction, its main rail being rated for a load capacity or 250 lbs (113 kg). The machine has a fairly small footprint compared to other types of rowers. It’s approx. 50″ (127 cm) long, and 36″ (92 cm) wide. The base frame width is actually only approx. 20″ (51 cm), but with the arms extended, the machine’s overall width reaches approx. 36″ (92 cm). The main body of the machine does not fold. However, the side arms can be folded along the rail to save space. The unit can be stored vertically, or flat, depending on your storage possibilities. 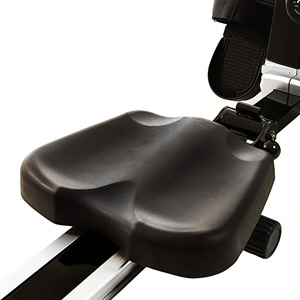 The front base of the rower rests on two rubberized pads which improve its grip on the floor. The rear base has a small leg with a large stabilizer which provides plenty of stability. The rear stabilizer elevates the rear of the machine a little bit. Therefore, the rail is slightly oblique so the machine delivers a slightly better workout for the legs. The rower’s metallic parts are coated with a corrosion-resistant paint finish. The main color used is black, with the exception of the rail core which is white-green. 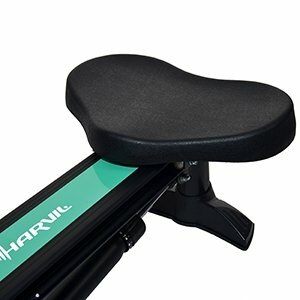 The seat included with the Harvil RM-1 does not integrate any cushioning. However, it’s approx. 14″ (34 cm) wide, and has a concave surface, providing optimal comfort. The seat glides on a set of large rollers which integrate ball bearings for a smooth motion. The rollers are cradled by the side rails and the side seat parts superior safety. The rail provides plenty of travel for the seat. Therefore, the machine should be able to accommodate users up to 6’3″ (190 cm) comfortably. Also, as we’ve mentioned above, the seat and the rail are rated for a weight capacity of 250 lbs (113 kg). The oars consist of two parts each. The bottom part is attached to the resistance cylinder in order to provide resistance when you row. The superior part pivot and can be rotated independently. This adds a bit of flexibility to the rowing motion, rather than the complete, rigid motion offered by rowers with a pulling cord or chain. Differently put, you can row with a circular motion or a straight motion if you want. The grips on the handlebars are covered by rubber foam, to eliminate stress on the palms, and the formation of blisters. The unit’s footrests are fairly large and feature heel guards and adjustable straps. They’re made of durable nylon material. They also have a pivoting design and can tilt slightly to adapt better to your rowing motion. As we’ve mentioned above, the Harvil RM-1 is a hydraulic rower. Its resistance system consists of a hydraulic cylinder placed under the rail. The oars are attached to it, and with each stroke, it extends, generating the necessary resistance. The cylinder offers 12 levels of resistance. Its rear section has a dial which you can turn in order to increase or decrease its overall resistance. As opposed to the machines with air or water resistance, the resistance generated by this machine is constant. In other words, it’s only related to the selected tension level; it does not depend on your rowing speed. But on the other hand, the usage of oars resembles the feel of rowing a real boat. Also, you can only use one oar if you want to put a bit of diversity into your workouts. 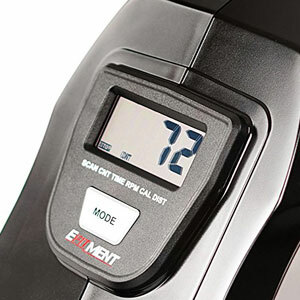 This rowing machine is equipped with a basic fitness meter which tracks the most important workout metrics, including time, count, total count, and calories burned. The unit is not telemetric, though. It cannot track your pulse and is not compatible with any HR transmitters. So, in case you need to monitor your heart rate during your workout sessions, you will have to use a separate device. The fitness meter unit features only one button which toggles its scan mode ON or OFF. With the scan mode on, it rotates all the workout metrics, showing each one for a few seconds. The unit requires two AA batteries which are not included. It turns on when you press the button or begin your rowing session. It also has a sleep function to which will enter after a few minutes of inactivity on the machine, to save battery life. 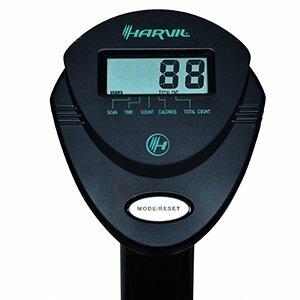 The Harvil RM-1 is a hydraulic rower featuring a 12-level resistance system. It offers high portability and excellent comfort. Its frame is durable enough to support users up to 250 lbs. It’s also one of the most affordable rowing machines that you can find at the moment, currently priced for less than $150. If you’re looking for an entry-level magnetic rower, the Efitment RW025 is definitely one that you should put on your list. This is one of the best trainers under $250 that you can find at the moment. Although it offers a rather basic range of features, it still offers the possibility to engage more than 80% of your muscles and benefit from a full-body cardio workout. The Efitment RW025 features a steel-made frame with a weight capacity of 250 lbs (113 kg) which is not bad for a basic trainer made for home use. The fully assembled unit isn’t too heavy or difficult to assemble. It weighs approx. 43 lbs (19.5 kg), and its front base is equipped with transport wheels. This Efitment rower considerably smaller compared to other rowing machines. It’s only 62″ (158 cm) long, and 20″ (51 cm) wide. However, its rail offers approx. 40″ (101 cm) of travel for the seat, which means that it should be able to accommodate users up to 6’2″ (187 cm) with no problem. All the steel parts in the frame construction are coated with a rust-resistant paint finish. The color used is light gray, this being the only color available for this model. The only major parts in the machine’s construction that are not made of steel are resistance system covers and the footrests. This rowing machine does not have a folding frame. However, the unit can be stored vertically, resting on its front base and a small stabilizer of the ABS case of the drive system. 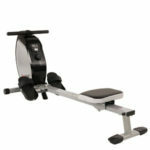 The Efitment RW025 rowing machine features a foam-cushioned top with a durable and sweat-proof vinyl upholstery. It’s approx 16″ (40 cm) wide, offering plenty of contact surface. It delivers an excellent level of comfort and stability. The seat’s frame is steel-made. It integrates three sets of wheels, two on top of the rail, and one underneath. The wheels are concealed to maximize safety. They’re equipped with high-grade ball bearings for a smooth and quiet travel. This rowing machine features a set of pivoting footrests. This means they can slightly tilt during each stroke, allowing you to perfectly adjust the position of your feet. The footrests are large enough to accommodate any type of athletic footwear. They’re made of durable ABS material, have a bit of a heel guard for extra foot stability, and are equipped with adjustable straps. The machine’s pulling handle is a simple straight bar with rubberized grips. It’s attached to a durable nylon strap which delivers a very smooth and quiet motion and recovery in the internal spool. This rowing machine is equipped with a manual magnetic resistance system. The main resistance elements are a small magnetic brake, the tension dial on top of the front ABS casing, and an internal flywheel. The magnetic brake is attached to the tension dial via a steel wire. By turning the dial clockwise, the brake comes closer to the metallic flywheel, increasing the intensity of the internal magnetic field. This results in a greater rowing difficulty. There are 8 distinct levels of resistance. The flywheel isn’t extremely heavy. It weighs approx. 8.8 lbs (4 kg). It has a balanced structure and provides a very smooth and steady motion. Also, since the resistance doesn’t involve any air current or friction, the resistance system is almost completely silent. Since the machine doesn’t have any air or water resistance elements, it doesn’t provide a dynamic response. In other words, the resistance does not increase if you pull faster or harder. But nonetheless, the machine still provides a very consistent cardio workout. The exercise meter included with this rowing machine is a basic one. It features an LCD display and only one (MODE) button. The button allows you to toggle ON/OFF its scan function which rotates all the values on the screen. With the SCAN mode ON, each value appears on the display for a few seconds. When you disable the SCAN mode, you can basically select any of the values to be shown all the time. The display tracks time, distance, count, RPM, and calories burned. The count value indicates your total number of strokes, while the RPM value indicates your strokes per minute. The console cannot track your pulse. It is not telemetric and does not work with Polar or other types of HR chest strap, ear clip, or bracelet transmitters. Finally, the console requires one AAA battery. It starts up when you begin rowing and will self shut-down after 4 minutes of inactivity on the machine. 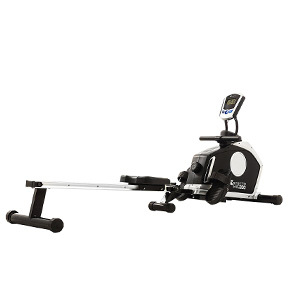 The Efitment RW025 is an entry-level rowing machine equipped with a magnetic resistance system and a basic fitness meter. It has a load capacity of 250 lbs. Its frame doesn’t fold but it can be stored vertically. It’s perfect for muscle toning, stamina development, and weight loss. And finally, it’s one of the most affordable magnetic rowers, currently priced for less than $250. Why Should You Buy a Rowing Machine? To make this clearer, we’ll start with the few downsides related to rowing. First of all, due to the seated position, a prolonged rowing session can lead to numbness of the buttocks. And second of all, this type of exercise does put some stress on the lower back. Especially users new to this may experience lower back soreness and even pain after several few sessions until their body adapts to this kind of workout. That’s why, due to the stress on the lower back, a rowing machine may not be exactly the best choice for users with problems of the lumbar area. But on the other hand, there are quite many positive aspects related to this type of cardio training and to these machines in particular. Rowing comes with a wide array of benefits. Whether you’re rowing an actual boat or an indoor rower, it basically has the same effects on your physique and cardiovascular system. It’s pretty obvious that the workout posture promoted by either a rowboat or a rowing machine eliminates an important part of the impact on the leg joints of the user, as the upper body weight rests on a seat. The workout involves multiple groups of muscles in the torso, arms and especially legs, and therefore results in a really consistent aerobic workout. Due to this fact, you don’t even have to pull extremely hard, in order to obtain a rich cardiovascular workout. That’s why a rowing machine is an excellent choice for users who are no longer young and age has already taken its toll on their bodies. But nonetheless, these are machines for users of all ages. Since rowers interest multiple groups of muscles, they’re great machines for boosting strength and stamina. And due to the low impact on the leg joints, they’re actually great machines for overweight users, who are just trying to get back into shape. In this case though, it’s important to underline that if you want a rower machine to use at home, it’s best to check and double check its maximum user capacity, to make sure you end up with a solid machine, not one that will fall apart under your weight. As opposed to a treadmill which requires quite a bit of focus when running, a rowing machine will actually help you disconnect. Especially if you use a water resistance rower machine, which resembles closely the motion of rowing a real boat, a workout of this sort will actually help you relieve stress and calm your nerves after a busy day at work. Since most rowers come with at least a basic console, it’s easy to track your progress or quantify your workout. Even more, some models feature online connectivity, giving you the possibility to compete with other users worldwide. Last but not least, a rowing machine gives you the possibility to row in the absence of a boat, and/or in the absence of a body of water. You can also undergo your training in the comfort and safety of your home. Differently put, can watch TV or watch your favorite online streams during your workout, without being exposed to most of risk factors related to being out in open water. There are four main resistance systems featured by rowing machines: water-based, air-based, magnetic and hydraulic. Evidently, each type of resistance has its own specifics, but as a general idea, water and air rowers feature a “naturally variable” resistance. In other words, if you exercise on a water or air rower machine, the harder you stroke, the more resistance you should experience. Conversely, a rower featuring magnetic or hydraulic tension system cannot render this “naturally variable” feel. Even if they do feature multiple levels of resistance, for each setting the resistance will be constant, and it is not conditioned by the strength you put into your stroke. Now, regardless of type, just about any rower should provide a consistent cardiovascular workout. If this is what you’re looking for, you can basically go with any type. However, if you want to train on a professional level, or train for rowing an actual boat, the natural “feel” of the stroke may be necessary. That’s because a rower with constant resistance may affect your technique, or enable you to develop bad habits. Therefore, in this case, it’s best to opt for a water or air rower. There are actually several differences between rowing machines made for home use, and the commercial grade ones. The two main indicators are maximum user capacity and price. It’s pretty obvious that a rowing machine which is supposed to be used by a wide array of users, within the premises of a gym or club, should be able to withstand even the heaviest users. Thus, most gym-grade rowers have a maximum user capacity of 500 or even 700 lbs. A sturdier build, a higher quality tension mechanism, and a more advanced performance tracking console also lead to a higher price. Also, most rowers you’ll find in gyms feature water or air resistance. On the other hand, there are rowers designed for home use, which usually feature a lower weight capacity, typically up to 300 lbs., a basic design and console, and in general, a folding frame to save space. Most of these models feature hydraulic or magnetic resistance, but you can also find models up to $500 that feature air resistance. Most of these models focus on providing a light to medium intensity rowing training, while most of the ones in gyms can provide the training setting and workout tracking required by professional athletes. Exercising daily is necessary, and when it comes to this, there are many machines that can supply you with an excellent training setting. But if you’re looking for one that can offer a superior aerobic training, build stamina and strength, and tone multiple muscle groups, all with a minimal impact on the leg joints, a rower is the perfect choice. All the rowers mentioned here were meticulously analyzed, all of them featuring a solid price/quality ratio. Thus, this page should serve as a good starting point for choosing a model perfectly fit for your budget and home-gym.